Yummy Avocado Lime Chicken Enchiladas are filled with shredded Mexican seasoned chicken, lots of melty Monterey Jack cheese and then topped with a scrumptious avocado-lime sauce. Olé! Avocado Lime Chicken Enchiladas is my third chicken enchilada recipe leading up to the grand finale on Thursday, May 5, which is Cinco de Mayo. 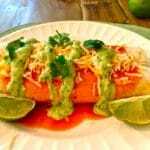 My Chicken Enchiladas Three Ways Series should give you some great options when you are trying to come up with a delicious make-ahead dish that will wow your family and friends on this fun day. I’ve already posted recipes for Salsa Verde Chicken Enchiladas and Tequila Lime Chicken Enchiladas, and today I’m really excited to feature the recipe for Avocado Lime Chicken Enchiladas. All three chicken enchiladas are delicious, easy to prepare and the only problem you will have is trying to decide which one to make. Avocado Lime Chicken Enchiladas feature flour tortillas filled with shredded chicken that has been marinated in spicy Mexican seasoning and lots of melty Monterey Jack cheese. Then they are topped with even more cheese and baked in a yummy red enchilada sauce. Finally, the enchiladas are covered with a knock-your-socks-off, scrumptious avocado-lime sauce to cool things down a bit. Yum, yum and double-yum! They are out of this world good! 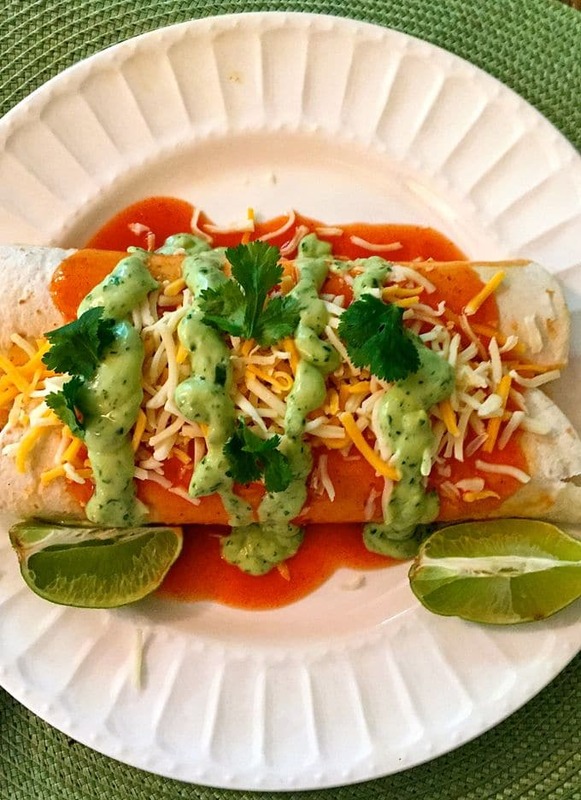 Ready to make Avocado Lime Chicken Enchiladas? 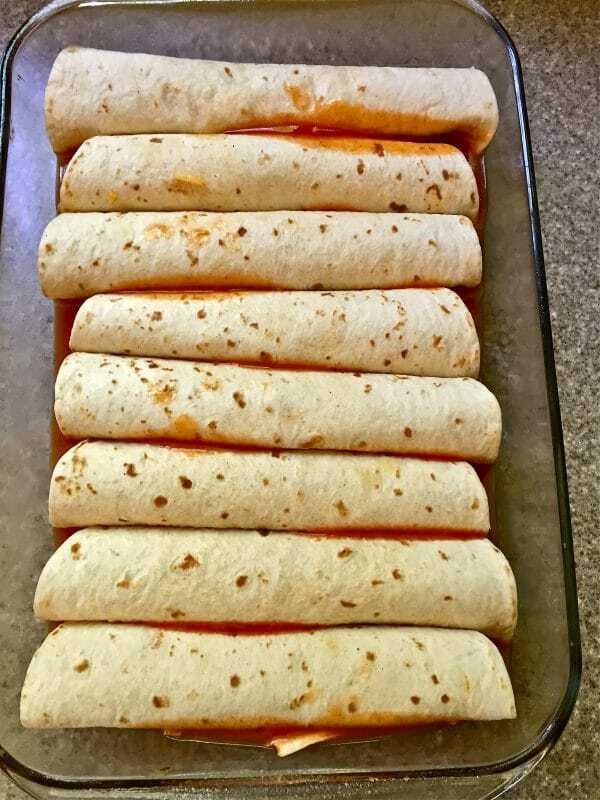 Then gather your ingredients for the enchiladas which are: flour tortillas, ground cumin, chili powder, Mexican spice blend, salt and pepper, chicken which has been cooked and shredded, olive oil, onion, red enchilada sauce, and Monterey jack cheese. 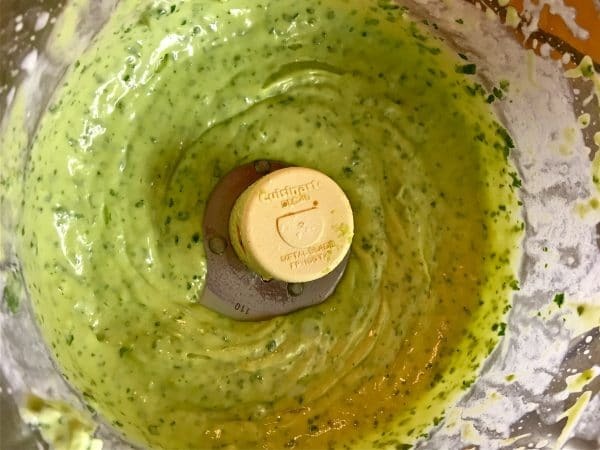 The Avocado Lime Sauce ingredients are an avocado, Crema (Mexican cream), fresh cilantro, garlic, salt and lime juice. Add the cumin, chili powder, Mexican spice blend and salt to a large bowl and mix well. Add the shredded chicken and make sure it is completely covered with the spices. Let sit for a few minutes for the flavors to develop. Add onions to a medium size skillet and cook for 9-10 minutes over medium-low heat or until they are brown and caramelized. 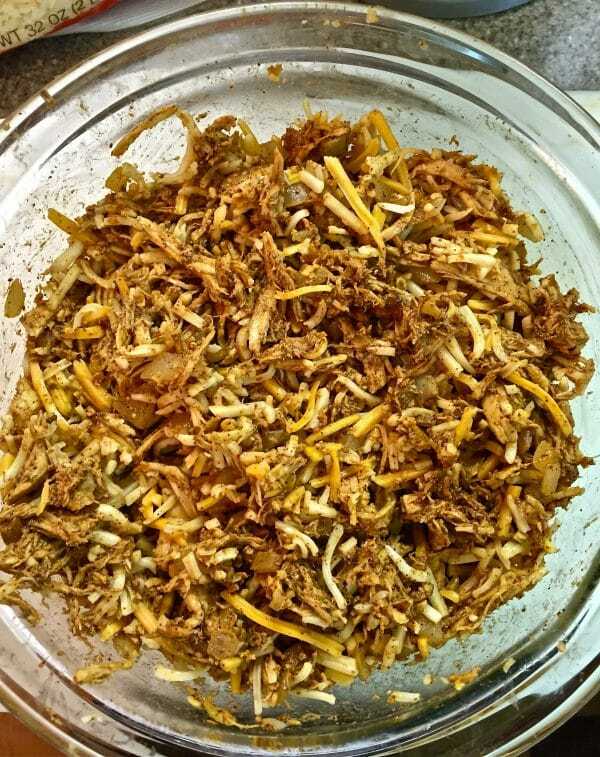 Add the onions and 3 cups cheese to the shredded chicken mixture and mix well. 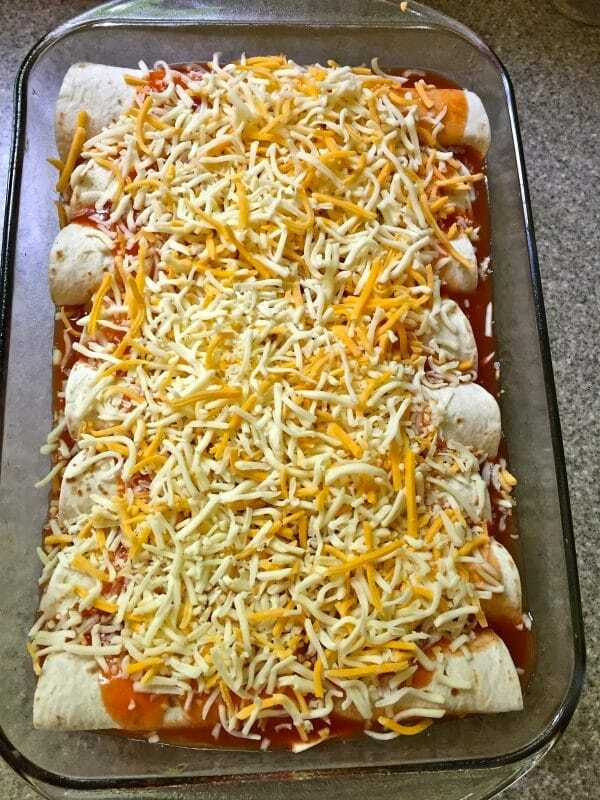 Pour 2 cups of the enchilada sauce into a 9×13 baking dish and spread out evenly. Top the enchiladas with about 2 cups more of the enchilada sauce (You want the enchilada sauce to cover the bottom half of the enchiladas.) Then sprinkle 1 cup of shredded cheese on top. Bake for approximately 35-45 minutes or until the mixture is bubbling and the cheese has melted. Let sit for about 10 minutes before serving. Add all of the ingredients to your food processor fitted with a steel blade. Pulse until the mixture is smooth and creamy. Add a little more water if you want a thinner sauce. Just before serving the Avocado Lime Chicken Enchiladas, pour the Avocado Lime Sauce over the enchiladas. Optional: Garnish with sour cream, avocado, pico de gallo, salsa, or cilantro. Avocado Lime Chicken Enchiladas are filled with shredded seasoned chicken, lots of melty Monterey Jack cheese and topped with a scrumptious avocado-lime sauce. Add the cumin, chili powder, Mexican spice blend and salt to a large bowl and mix well. 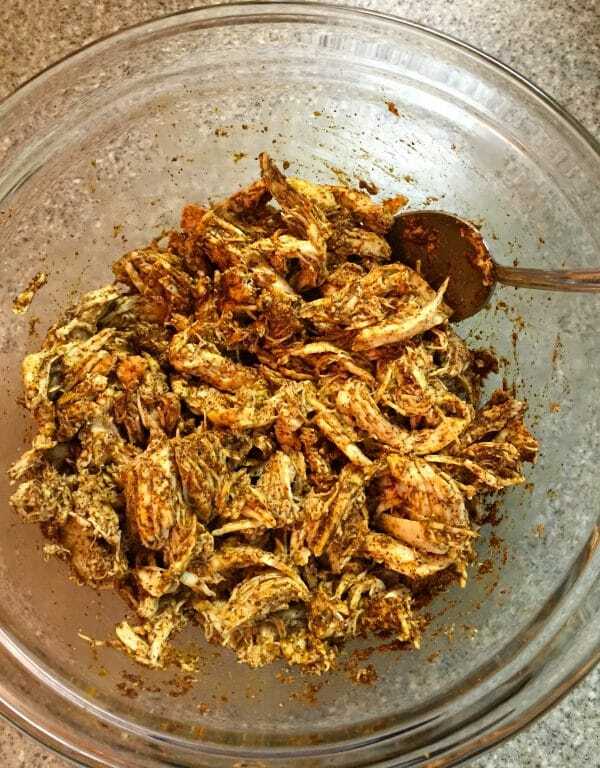 Add the shredded chicken and make sure it is completely covered with the spices. Let sit for a few minutes for the flavors to develop. Pour 2 cups of the enchilada sauce into a 9x13 baking dish and spread out evenly.